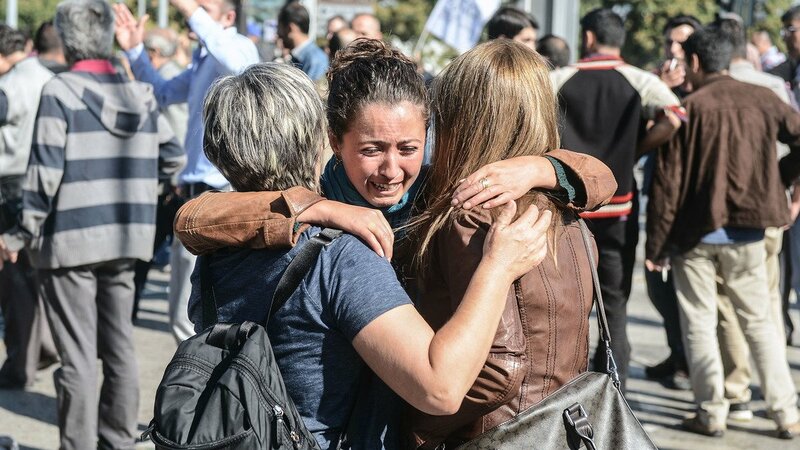 Turkey has declared three days of national mourning after two explosions at a peace rally in Ankara killed at least 95 people on October 10, the deadliest ever such attack in the country. Ankara attack left 245 people injured, with 48 of them in a serious condition. The government called the two explosions a “terrorist act” and angrily rejected allegations that it was to blame. PM Ahmet Davutoglu said there was evidence that two suicide bombers had carried out the attack, which comes three weeks before a re-run of June’s inconclusive parliamentary elections. The two explosions took place near Ankara’s central train station as people gathered for a march organized by leftist groups demanding an end to the violence between the Kurdish separatist PKK militants and the Turkish government. The blasts happened shortly after 10:00 local time as crowds gathered ahead of the rally. Amateur video footage showed a group of young people holding hands and singing, as the first blast hits. No group has said it carried out the attack, but PM Ahmet Davutoglu suggested that Kurdish rebels or the Islamic State (ISIS) group were to blame. According to terrorism experts, the attack is similar to one that was carried out in Suruc in southern Turkey by ISIS in July in which 30 people died. However, the leader of the pro-Kurdish HDP party, whose members was among those attending the rally, has blamed the state and cancelled all election rallies. The HDP has previously blamed the government for colluding in attacks on Kurdish activists, which the government denies.